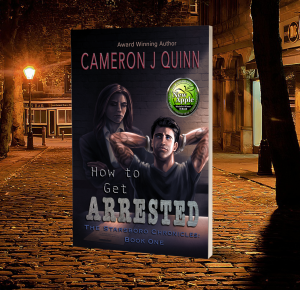 I’m Marissa Frosch, my author name is Cameron J Quinn. I chose the pen name in honor of my grandmothers. Putting together their maiden names, I was able to a create a name I really felt was my own. My first book, How to Get Arrested, won the New Apple Award for Literary Excellence in the humor category shortly after publishing. Growing up in New Hampshire surrounded by nature I couldn’t help being inspired. One of my earliest memories is of my mother typing on the computer. We had one of those old ones with the black screen and yellow pixelated text. She’d write all day and tell me the new Froggy story that evening. I have no idea how many she made or what the stories were about, besides a frog. What I do remember is sitting on the floor and listening to stories my mother created. A divorce and a year or so later I was writing my first “books”. When I was six years old and my teacher asked us to write a story. I wrote more than one, I couldn’t stop. As I grew so did my stories. In high school, I met Sara. Something that seemed like fate at the time ended up being even more important than I ever could have guessed. In 2014 we would be more than best friends, as business partners, we started Amphibian Press and Amphibian Authors and published our first book, Smoke and Rain by V. S. Holmes (2015). Since then we’ve published a total of 12 books with another 6 scheduled for release in 2018. Helping other authors is my passion, which is why I started the Amphibian Authors blog and Sara and I are working on a series of non-fiction books. I earned my Associates Degree in Marketing at Southern New Hampshire University in April 2018.